Hook: 4mm (for tractor and wheels) and 3 mm (for the exhaust). Tapestry needle. Stitches: Chain (ch), single crochet (sc), half double crochet (hdc), slip stitch (ss). 1. Ch 13, turn, 12 sc. 9. – 12. Ch 1, 1 sc in green, end stitch with white yarn, 4 sc in white, end last with green, 1 sc in green. 13. 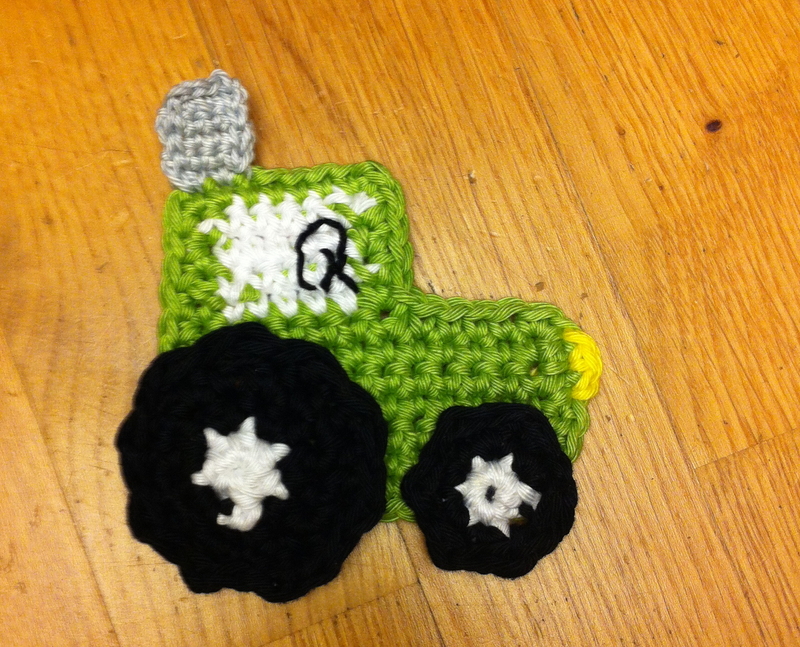 Crochet one round of sc in each stitch around the whole tractor, make 2 sc in the corner stitches. Fasten off, weave in the ends. 2. ch 1, 6 sc in ring, ss in first sc (end with black yarn). 3. ch 1, 2 sc in each stitch (12 sc in black), ss in first sc. 4. ch 2, *1 hdc, 1 ss* repeat for the whole round, ss in chain. Fasten off, weave in the ends. 2. ch 2, 6 hdc in ring, ss in first hdc (end with black yarn). 3. ch 2, 2 hdc in each stitch (12 hdc in black), ss in first hdc. 4. ch 2, * 1 hdc, 2 hdc in one stitch* repeat for the whole round (18 hdc), ss in first hdc. 5. ch 2, *1 hdc, 1 ss* repeat for the whole round, ss in chains. Sew the wheels in the tractor. Embroider the steering wheel with black yarn and tapestry needle in back stitches. Draw a loop, 1 ss, 1 sc, 1 ss, fasten off, weave in the ends. 6. ch 1, 1 sc, 2tog, 1 sc (3 sc). fasten off. 5. make ss around the exhaust. fasten off, weave in the ends. Sorry for my late reply! Of course you can translate the pattern if you need to. If you want to share the pattern in danish – thats fine too, as long as you make clear that it is originally my pattern and link it to the page where the original pattern can be found! Hello, I’m stuck at step 2, can you verify what i should do when it says -7? In row 7 from the main part pattern you make one chain and turn, then crochet 12 single crochet. Now I got it: it means for row 2 until row 7 you make one fhain then 12 single crochet. !